They say that time waits for no man and it seems neither does Duncan McLellan when there's a UKIPT title on the line. The British grinder managed to make short work of his opponents as the final session of UKIPT Nottingham's Main Event got underway. The bricklayer took less than four hours to claim the win after arguably the most aggro table in the history of the UKIPT. Overnight chip leader Willie Elliot set the ball rolling with some super aggressive moves that saw him build up a stack of 10m. It wasn't to be for the Scot though, of which more later. The first man to go was Ramey Shaio, losing a flip with AQ against McLellan's pocket fours. McLennan also delivered the second knockout blow, coming from behind with QhJh to beat the short-stacked Anthony Flynn's Ac7s. Juan 'the Moustache' Benito followed, with McLellan making it a hat-trick of eliminations. The Spaniard needed help from the deck holding AK against the Briton's pocket nines but the poker gods failed to deliver and he hit the rail in sixth, £38,400 to the good. The most familiar face at the final table was that of Ryan Spittles. The Sky Poker TV pundit couldn't gain any momentum and eventually took a stand with KsJd. Angelo Milioto looked him up with Ad10s which was good enough to hold. The carnage continued with the one time wrecking ball Willie Elliot exiting in fourth spot. After McLellan led out on a Ac-2c-8h-Ah-Ad board, the Scot, holding pocket threes, made a big re-raise all in. McLellan, holding the case ace for quads snapped him off and we had ourselves a new monster chip leader. It didn't take long for McLellan to put his dominant stack to good use, busting the patient Trevor Pearson with AK over AJ. Third place was a fine effort from Pearson who started the day as one of the short stacks. The final pair agreed a chop with £34,000 left on top and moments later, McLellan scooped the lot when his turned straight held to beat Angelo Milioto's trip sixes. 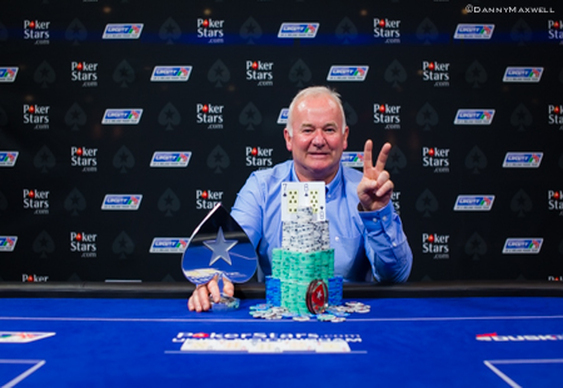 "I had no fear of going broke,” the delighted winner told PokerStars' Nick Wealthall. “You can't win a tournament without getting your chips over the line. This has just been a weekend away really. I want to go out to Vegas and play the main event but I'll be back on the scaffold tomorrow!" And to think, he didn't even know the rules three years ago. Well played sir. The UKIPT heads to Marbella in Spain for its next stop. There's €500,000 guaranteed in the €1,000+€100 Main Event which runs from 11-15 June. Qualify online at PokerStars. Image courtesy of Danny Maxwell and PokerStars.